Windows 7 is leaving Microsoft’s mortal plane next January. There’s no reason to fear its “official” demise — but every reason to understand what’s actually happening. In the past month or so, I’ve visited my doctor’s office, my dentist’s office, my accountant’s office, and my son’s classroom. I even caught up with one of my brothers. They all have one thing in common: they’re all still on Windows 7. And they have something else in common. Although they vaguely understand that Win7 is being retired soon, they really don’t understand what that means — or why they should care. In fact, in my experience with a great many Win7 users, very few understand the implications of the change — and even fewer understand their options. Here’s what every Win7 customer needs to know. There’s some good news and some bad news — and a whole lot of not-exactly-good news about Win7’s official end of life (EoL). Today, nearly half of all Windows machines still use this venerable OS. You probably know more than a few people who are still using it — and they need to know the truth about Win7’s EoL, even if they aren’t interested. Here are the facts, as best I can discern them. Sure, that’s a really basic question. But some of your friends might not know what version of Windows they’re using. There are fancy ways to tell, but the easiest is to just look at the lower-left corner of the screen. If it looks like the screenshot in Figure 1, they’re running Windows 7. Figure 1. If it has the classic Win7 start button, it’s Windows 7. Figure 2. The trapezoidal-window Start button and outsized search bar are telltales for Windows 10. What’s really happening in January? So Windows 7 won’t go out with a galactic bang — the real question is how much it’ll whimper. If you’ve been using Win7 for a few years, you probably recall the gut-wrenching disaster known as the “Get Windows 10” campaign (GWX, for short). While GWX was active, we saw increasingly aggressive admonitions to install the free upgrade to Win10 — culminating in Microsoft confusing the living nightlights out of everybody and pushing Win10 onto every machine it could get its hands on. GWX was a huge black spot on Microsoft’s reputation, and it still haunts many Win7 users to this day. Microsoft learned its lesson … I think. I don’t expect a GWX-style campaign this time around, one that virtually forces people onto Win10. Instead, Microsoft’s going to make people think that the sky is falling and graciously offer to save them. That’s the duty of the new Win7 patch, KB 4493132 (more info); Bleeping Computer’s Lawrence Abrams gives the technical details. When the patch installs, many (if not all) Win7 owners will see an admonishment — a nag screen — that looks like the one shown in Figure 3. The good news: Checking the box marked “Do not remind me again” should prevent the screen from reappearing. The not-so-good news: Microsoft’s idea of “prepare for what’s next” might not reflect what you want to do. Figure 3. All Win7 users should soon see this nag screen. Turn future nags off by clicking the marked box. We’ll have ongoing coverage of the Win7 EoL nag screen and its behavior — good or bad — on the AskWoody Lounge. The Lounge discussion is already up to its second version, and the nag screen hasn’t even shown up yet. What do Win7 users need to do right now? Remember that these changes won’t happen until next January. There’s no reason to immediately run out and buy a new computer or get a free upgrade to Win10 on an existing computer via an arcane and legally dubious trick. Win7 users have at least six to eight months to carefully consider the changes that are coming and decide how best to deal with them. Again, there’s no reason to immediately shed Windows 7 like a worn-out suit. Most of the important apps — Firefox, Chrome, Intuit, Photoshop, Dropbox, VLC, Plex, and many more — will continue to work safely on Win7 for some years to come. Microsoft might or might not continue to release Security Essentials updates for the OS. But if the company does drop antivirus protection, there are plenty of reliable and free alternatives. Just keep in mind that, after January, Microsoft is under no obligation to fix newly revealed security holes in Win7. That said, after XP reached its EoL, Microsoft released patches for several major problems that came barreling down the chute. What is it the financial reports say? “Past performance is no guarantee of future results.” In other words, your guess is as good as mine. Perhaps we’ll know more as January approaches. While staying with some form of Windows is one option, another is to switch to a completely different OS. In my opinion, most Windows users would be better off with a Chromebook (more info). These machines are more reliable, virtually impervious to infection, and cost less than PCs. Yes, Chromebooks won’t run certain apps that a small percentage of Windows customers need for personal use. But in most cases, you can get equivalent or good-enough programs — free — that run on a Chromebook. Another option: Almost all infections these days come through a browser or by clicking an email attachment. Avoiding both on Win7 machines will make them much more secure. A smartphone or tablet is a good choice for online tasks. Microsoft has every reason to cow Win7 users into either buying Windows 10 or purchasing a new PC with Win10 installed. But what’s good for Microsoft isn’t necessarily good for Win7 users. Keep in mind the many options. That said, upgrading to Win10 can be a workable choice, even on older systems. One of my Win10 beta-test machines is an eight-year-old Sandy Bridge PC, and it’s running just fine. It’s a bit slow, mind you, but nothing to complain about. If nothing else, Win7’s impending EoL should put users on notice: It’s really important to start making regular and full backups. You can never have too many. I use EaseUS Todo Backup, but there are many alternatives — even Win7’s built-in backup system. Microsoft has various reasons for moving folks off Windows 7. To be sure, the cost and difficulty of keeping the OS safe is one factor. (There are only so many ways to patch an old OS.) But remind your friends that those nag screens are just reminders — they have no effect on the performance or longevity of Win7 systems. But you will be skating on thinner ice. Be mindful that the end of security updates has consequences, but it’s not the end of the Windows 7 world. There are many tools at our disposal. 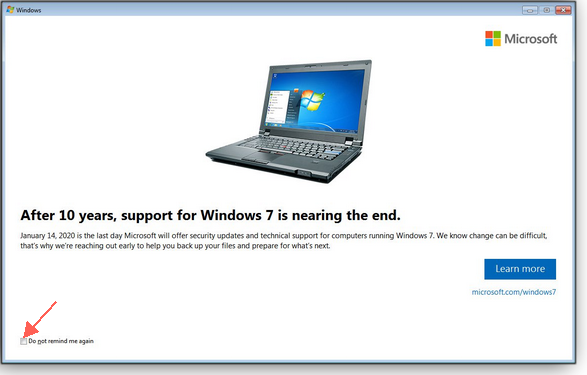 And take solace in knowing that many fellow Win7 users will continue to rely on the OS long after January. If you stick with Win7 for another year or two, you’ll be on the tail end of the Windows deployment curve, but that beats the bleached bones out of being on the bleeding edge. Just remember: We’ll be there to help. As reported in Fortune and other deep sources, Microsoft will flog any employee caught playing an April Fools’ prank. No, not really. The employee will lose their free morning espresso for a week. No, that’s not it. I guess you just have to read the Fortune story. For those of us in the northern hemisphere, spring blooms might remind us that April has arrived. And April means that the next major Windows 10 feature release should soon be appearing, too. Since some of us are just getting last fall’s Win10 1809, it’s high time we all ensure that our update-deferral settings are in place so that our machines move to Version 1903 only when we’re ready for it — and only after we’ve run a full-system backup. Compatibility issues related to recent updates are still causing headaches for some. In a March 22 AskWoody post, Woody reported problems with older versions of Dell’s Encryption Console after installing March cumulative updates. According to Dell, you must update to Console Version 10.2.1 or later — or uninstall the March Windows updates. There are various other hiccups with the March fixes, though I don’t consider any of them to be true showstoppers. I’ve not run into any errors on my home or office machines. We’re still tracking the following side effects, noted in KB 4489899 for Win10 1809. And at this time, Windows 10 1809 has still not received its normal follow-up update to fix the issues listed below. On my Win10 1809 laptop, the only side effect I was likely to see was the audio-driver bug. But it never showed up. On March 12 — Patch Tuesday — Microsoft released the expected round of cumulative updates. A week later (March 19), it released more updates with optional fixes and enhancements — although fixes for the issues listed above aren’t included. And, again, we’re still waiting for the optional update for Version 1809. If you’re still on Win10 1709, here’s a reminder that it’ll reach its end of service on April 9, 2019. That includes devices running Home, Pro, Pro for Workstations, and IoT Core editions. You’ll need to be on 1803 or later to receive updates after April. More important are the March cumulative updates, listed below. By now you should have installed the usual Flash Player update (Adobe bulletin). Microsoft released it as KB 4489907. What to do: Again, none of March’s unresolved bugs is critical. Install March’s Win10 cumulative updates (listed above), but don’t click the “Check for updates” — you’ll inadvertently receive the optional preview updates. (It’s safer to set update deferrals for at least 10 days.) Install the optional updates only if you need one or more of the fixes that are included. What to do: Feel free to install the above updates, but skip preview rollup KB 4489893. As mentioned on AskWoody and previous Patch Watch columns, there’s an important servicing-stack update, KB 4490628, that needs to be installed all by itself. And you definitely do want to install it. Without it, you’ll stop getting updates this coming June. Look for a special article on what’s needed to keep older Windows versions updated. On the other hand, there are a couple of updates to skip, starting with KB 4489892, the preview of next month’s April updates. You really want to take a pass on KB 4493132, which is the infamous nag about Win7’s upcoming end of life (January 2020). What to do: After installing the March A or B series updates, be sure to follow up with KB 4490628. March introduced IE 10 authentication problems for Win Server 2012, and it’s not been fixed. Fortunately, it’s not a widespread problem — it crops up only with Remote Desktop Server. On March 19, Microsoft released monthly preview update KB 4489920. Skip it. What to do: Pass on preview update KB 4489920, but install all others. You might recall that we had just one security update for Office in March. KB 4462226 fixed a remote-code-execution vulnerability in Office 2010. What to do: I’ve seen no reports of issues with these updates. Feel free to install them at your leisure. Does your router’s Wi-Fi signal seep into every corner of your house? And even if it does, do you get a sufficiently powerful signal everywhere? If the answer to either question is no, you might consider adding a mesh network. These systems are somewhat like Wi-Fi extenders, but they’re generally easier to set up and manage. In a small home, a conventional router should be enough. But in a larger house, a mesh network will give you much better overall coverage and fewer hassles. 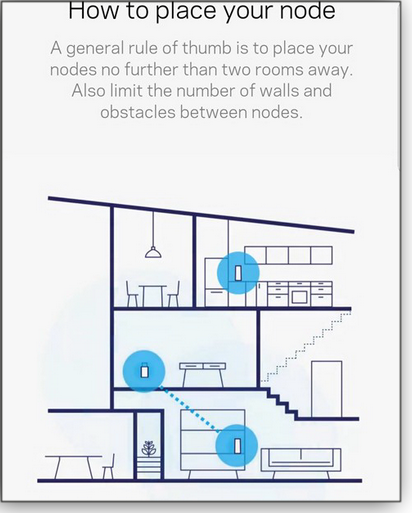 Mesh networks for the home market typically include a central router and one or more “satellite” devices placed in strategic locations. All components will work as a single network, creating a minimum of fiddling. Recently, I spent a few weeks testing two mesh-network models: Ubiquiti’s AmpliFi HD and Belkin’s Linksys Velop. Both can be purchased with either one or two satellites. Spoiler alert: They both work very well, but they come with different strengths; the AmpliFi is far simpler to set up, but the Velop is generally more powerful. If you’re lucky enough to live somewhere with a Fiber-to-the-home (FTTH) gigabit connection (as I do), you’ll really want a mesh network. When near my mesh router (in my office), I recorded Wi-Fi speeds of over 400Mbps. But even with slower broadband connections, a mesh network will assure that your home network is never the bottleneck. I’ve always had problems getting solid Wi-Fi into every corner of my home — and no, I don’t live in a mansion. Because I test technology for a living, it seemed reasonable to run broadband into my office, where I really need the fastest Internet connections. But my office is a small room in a semi-basement at the back of the house. The laundry room — packed with the metal-encased washing machine and dryer — sits between my office and the rest of the house. You need a powerful Wi-Fi signal to get through all that. That setup delivered decent Wi-Fi throughout the house, but I didn’t really have one Wi-Fi network — I had two networks with the same name and password. If I carried a smartphone, tablet, or laptop from one end of the house to the other, the device would generally stay locked onto the now distant router or switch — or at least try to. To fix the problem, you had to turn off the device’s Wi-Fi and turn it back on again. A mesh network doesn’t have that problem. Although there’s the single router plus one or more satellite antennas around the house, it’s all one network. When purchasing a mesh network, your first question is likely to be “How many satellites will I need to go along with the router?” Simply put, the more satellites you use, the more powerful the network — but also the bigger bite to your credit card. For instance, the AmpliFi HD router and one satellite will set you back U.S. $269 ($150 for the router and $119 for the satellite). Or buy the router and two satellites as a $340 package. In my modest home, I found only slight performance differences between using one or two satellites. I suspect that once a decent signal escaped my office, it was probably smooth sailing through the rest of the house. But as the saying goes: Your mileage may differ. More important than the number of satellites is where they’re located. Try placing one halfway between the router and the room with the worst Wi-Fi signal. 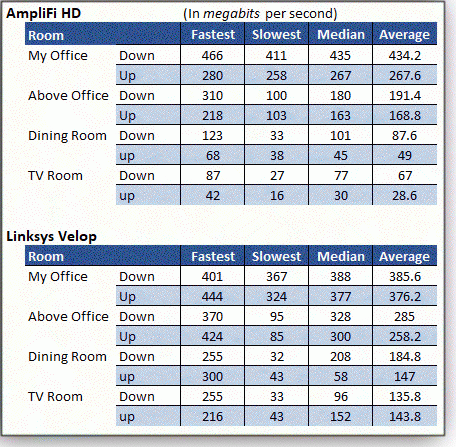 Figure 1 shows Linksys-recommended locations. Run Speedtest.net in a browser or install Speedtest on your phone to measure Internet-connection speeds at different parts of the house. Keep in mind that the speed you got today might not be the speed you get tomorrow. All sorts of things can slow down a Wi-Fi signal. Once during my testing, a connection produced just 45Mbps; but when I tried it again, it was 255Mbps. That’s only the most extreme example. Also note that satellites only help boost the network’s power. Even with two well-placed satellites, the Wi-Fi signal will still get weaker the farther you go from the router — although at a slower rate. Here are the highlights of the two models I tested. By default, the cube’s bottom glows, which struck me as both annoying and a waste of electricity. Fortunately, you can lower the brightness or turn it off entirely. Figure 2. The AmpliFi’s router pointlessly glows. Luckily, you can turn it off. 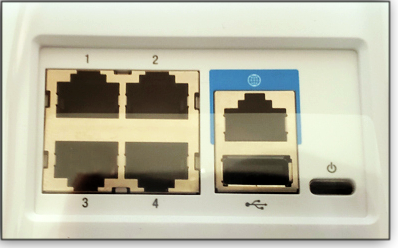 The back of the router has one Ethernet port to connect to your modem, four other Ethernet ports for wired-network devices, and a single USB port (see Figure 3). There’s also a USB-C port, but that’s only for powering the router. Figure 3. 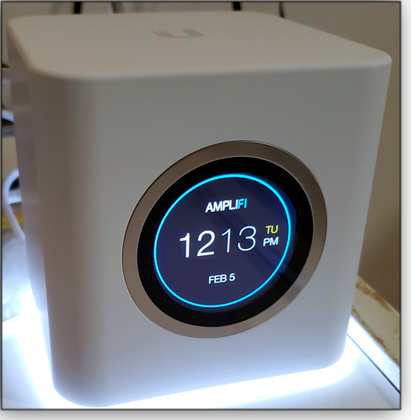 The AmpliFi router includes a typical set of ports. This is unquestionably the easiest router I’ve ever set up. You can use the AmpliFi Android or iOS configuration apps, but — because this is mostly a Windows newsletter — I tried the setup process on my computer. The cube’s front screen showed me a number, which I duly entered on a given website. I was then given just two fields to fill out: “NAME YOUR WIRELESS NETWORK” and “CREATE YOUR WIRELESS PASSWORD.” With that, my network was up. AmpliFi calls its satellites MeshPoints (see Figure 4), and setting them up is literally plug-in-and-go easy. 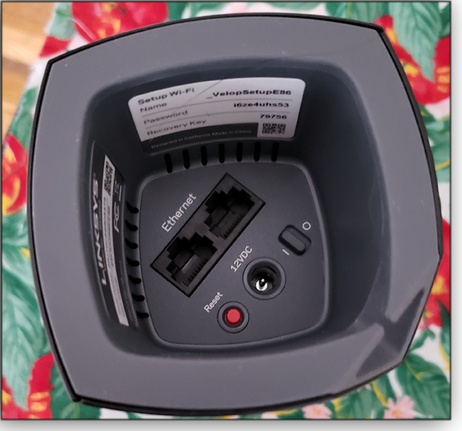 The device is basically an antenna that plugs into a conventional three-prong AC outlet. Plug it in, wait a minute or two for the five lights to go steady white, and your Wi-Fi network is now larger and more powerful. Figure 4. The AmpliFi MeshPoint plugs into any convenient AC outlet. With the router and the two MeshPoints set up, I got impressive performance throughout the house — though not as quick as with the Linksys. With a Linksys Velop network, there’s no physical difference between a router and a satellite. Linksys calls them nodes (see Figure 5), and you define one of the nodes as the “router” during setup. Figure 5. 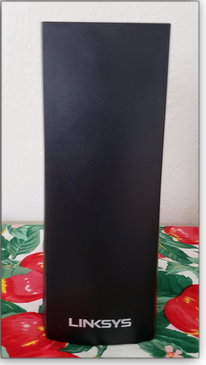 A Linksys Velop node can be either a router or a satellite. Figure 6. Velop nodes have just two Ethernet ports, and they’re not especially easy to access. With Velop, configuring the network involves a lot more than just plugging things in. The Setup Guide lists three simple steps — with the last one instructing you to follow the instructions on your Velop Android or iOS app. In reality, you must go through step after step after step. I’ve had more difficult router setups, but not recently. Turning other nodes into satellites requires even more steps on your phone. Once I got past setup, the Velop proved noticeably more powerful than the AmpliFi HD. In the TV room — the location with the weakest Wi-Fi signal — I recorded download speeds of up to 255Mbps. AmpliFi, by comparison, never got above 87Mbps. But those blazing AmpliFi numbers were rare, and Linksys’s slowest download speed in the TV room — 33Mbps — was close to AmpliFi’s 27Mbps. Figure 7 shows a summary of test speeds around my house. Figure 7. Overall, Linksys Velop produced far better network speeds throughout my house than did AmpliFi HD. Put simply, Velop won’t always outperform AmpliFi HD, but on average it’s significantly faster. Choosing between the two products, you might also want to think about where you’ll want wired Ethernet — if you use it at all. With the AmpliFi HD, you’ll have four extra Ethernet ports, but they’ll all be in the same room — on the router. With Linksys Velop, you’ll have one or two spare Ethernet ports in every room that has a node. Covering your house: If you live in a typical New York City apartment, you probably don’t need a mesh network. But if you have a moderate-to-large home, it’s an effective and often easy — though not inexpensive — way to enhance your domestic network. As every Windows user knows, File Explorer is the workhorse utility for managing files and folders — whether they’re stored locally, on external drives, or in the cloud. But sometimes we forget the many ways we can manage File Explorer itself, making it an even more useful tool. Here’s a reminder of some simple ways to bend Windows 10’s file manager to our will. File Explorer’s basic file/folder interface hasn’t significantly changed since the halcyon days of Windows XP — though there has been a steady series of enhancements along the way. The app formerly known as Windows Explorer acquired Libraries in Win7 — a feature that initially earned a lukewarm reception. (Many of us still haven’t tapped the power of Windows libraries.) 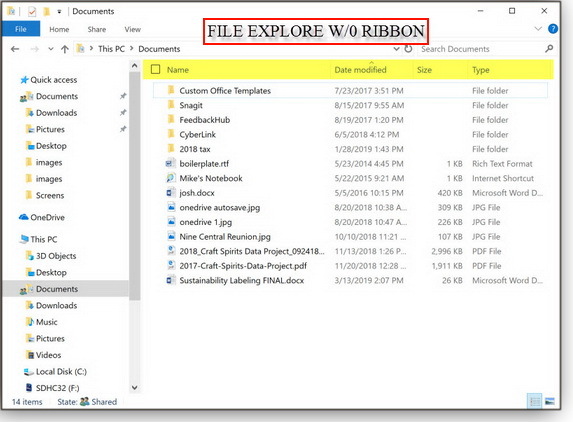 The Ribbon was added with Win8 — much to the annoyance of many longtime Windows users. And there have been numerous other, less visible, improvements. Figure 1. 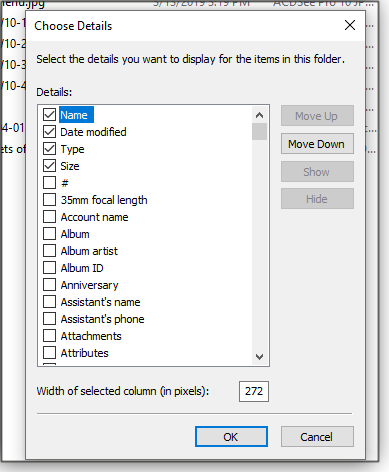 File Explorer’s default column types provide basic information. Want more info about your files? Right-click any of those column titles, and you now have access to hundreds of other column types, thus providing a customizable power-keg (pun intended) of app-specific details. And that’s just one of various ways you can tailor File Explorer to your needs. Here are some more. We all know that clicking a column title will reverse the sort order, be it alphabetical or numeric. But clicking the down arrow immediately to the right of the title pops up a list of simple filtering tools. You can, for example, quickly set a date range for filtering the Date modified column. In the Type column, the drop-down box lets you filter by file extension — e.g., JPEGs and Word documents. Swinging back to those additional column heads, right-clicking any title pops up a short list of column categories or types. Clicking More at the bottom of the list brings up the Details dialog box with a menu of around 300 descriptors. To add new columns in File Explorer, simply put a check mark next to those you want displayed — and leave unchecked those you don’t (see Figure 2). Figure 2. File Explorer makes it easy to select the information it displays about files. Obviously, most of these column types are application-specific. For example, if you have music files, you might want to add columns for Length or [track] # (see Figure 3). Likewise, if it’s a folder of screenshots or photos, consider adding Dimensions. Figure 3. Make File Explorer more useful by adding length and track number for music files. Obviously, neither Length nor Dimension is of any use for a folder of Word and PDF documents. But column types can give you worthwhile information when matched with a folder containing the appropriate type of file — provided that information is contained in a file’s metadata. Just because you add Video Compression to a folder of videos doesn’t mean you’ll necessarily see that information. Again, you can use the column-management boxes to uncheck columns you don’t need. There’s no point in having the Type column in a folder full of JPEGs. But you can also use the Details box to change the order of columns — or re-order them by simply dragging and dropping them around the title bar. You most likely know how to resize column widths by grabbing a column’s right edge. But you also have two options in the first column-management box: Size column to fit or Size all columns to fit. That’s standard Windows: multiple ways to solve the same problem. Information about a particular file is contained in its metadata — common stats such as date created, author, permissions, etc. plus information you might not know is kept. There may be times when you want to change, add, or remove elements of the metadata. Some of this information is locked; some isn’t — such as adding additional authors or editing a file’s read/write security settings. You can even clear most of the embedded metadata — removing, for example, personal information before sharing a file. Customizing a file’s metadata starts by right-clicking a file’s name in File Explorer and selecting Properties from the drop-down menu. The Properties dialog box sports anywhere from four to six tabs, based on file type, but for this discussion, we’re looking at the Security and Details tabs. Figure 4 shows the former. Figure 4. If you’re sharing a file, you might want to prevent others from changing it. Note that managing file permissions is another whole article in itself. A WikiHow article gives the basics, but — in short — to limit access to a file, you can click Edit in the Security box and then select Add. 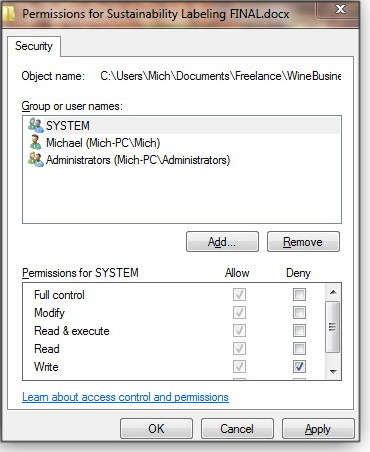 Enter a new group called something generic such as “Users” to the list, and Windows will automatically limit the group to read-only rights. You can then click the Permissions boxes to give them more or fewer rights. The Details tab provides more customization, though with some limitations. Moving your cursor down the Value column will give you a quick view of what can and can’t be changed. Editable fields will display a box where you can add, change, or remove metadata. For example, in Figure 5, Joe Schmoe contributed to the target document, though well after it was created by Michael Lasky. Via the Values column, I easily added his name to the Authors field — and I removed mine. Figure 5. It’s easy to change the metadata in any editable field. Here, I changed the name in Authors. As mentioned earlier, there are metadata fields you can’t change in Details. For example, you can’t edit Date Created or Date Modified — even if your lawyer thinks it might help to change that data before trial. However, there are perfectly legit reasons to change a file’s create/modify dates, and some third-party utilities will let you do so. Finally, File Explorer offers a more-powerful method for eliminating most — or partially removing some — of a file’s metadata. At the bottom of the Details box, click the Remove properties and personal information link. The Remove Properties dialog box will appear and offer two choices. The first is the nuclear option: File Explorer makes a copy of the file and clears all properties that can be removed. 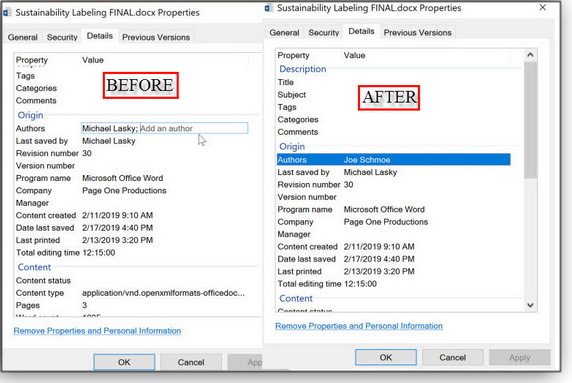 The second option lets you selectively remove properties from the original file. Note that the second choice doesn’t always work — you might get an exception error, probably due to some type of hidden permissions violation. If you’ve been using Windows for a long time, you might have forgotten more than you now remember. Take some time to refresh your working knowledge of Windows’ less-obvious tools.